Developer Quote: "Expo World helps you instantly access all the important information on the major trade fairs and expositions happening around the globe." Trade fairs or shows are a major way of bringing new products and services to the attention of the public, and are major marketing events in the life of many companies. Essentially, the trade fair is an exhibition arranged so that businesses can showcase their latest products or services. Usually you'll find demonstrations and samples of their offerings there as well. Trade Fairs may be held for all sorts of items such as Boats, Cars, Agriculture, Electronics, Fashion, Computers, Tourism, and the list goes on! For instance, there will be a Winter Fine Art and Antiques Fair in Birmingham, England at the Olympia building from November 14-21, 2011. (If you are interested in antiques, then you will surely want to attend this event!) I picked up this interesting tidbit of information from Expo World, and if I was able to attend, I'd have plenty of time to get ready for it! 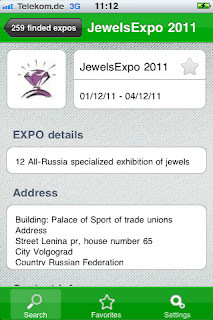 Open Expo World and enter your selection of Country, City, Category and Year. (In my case, I only used the Country and City fields to see all that was available). Then tap the Search bar to discover the relevant information. 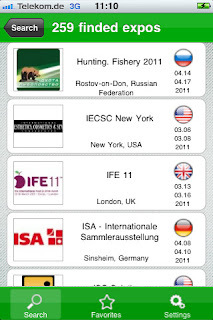 (Though plentiful, a few more countries and cities will greatly enhance the benefits of this app). 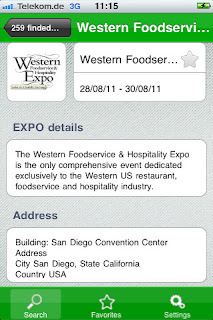 Individual text boxes listing the trade show name, date and logo will appear, and will give you specific information on each expo when you tap them. To continue the example of the Fine Art and Antiques Fair listed above, you are then given EXPO details, Address, Contact info, Exhibitors, Prices, Business hours and the URL for the show. To make life easier, save your preferred shows to the Favorites tab. All the information you need is now in the palm of your hand. Use the Settings tab to change the language of the app to your choice of English, French, Russian. Finally, tap the Update bar to refresh all the show information. You can start planning your part in the show or delegating colleagues to attend so that you are ready and organized on opening day. The clear, concise interface of this business app makes it so easy to use, with all the information highlighted or compartmentalized in its own category. A smart business associate is one who is well prepared and knows what to expect from the competition. 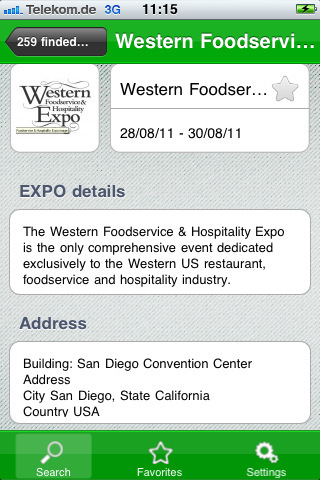 That is why Expo World is so helpful and business savvy. COOL CONCLUSION: "Expo World, with its pleasing interface and ease of use, makes it a snap to find trade shows that are relevant to you." 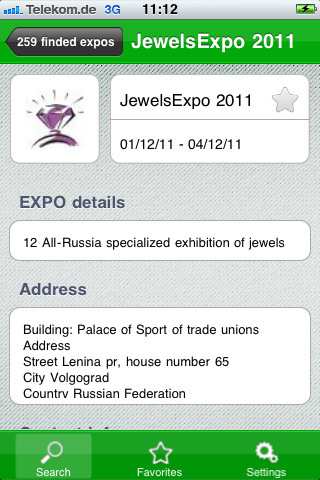 --Special Note: Expo World Lite is also available on the App Store for free. --Developer Link: ARCA Internet Services Ltd.